Shirley Chisholm, the first black woman to serve in Congress and the first woman to seek the Democratic presidential nomination, died on Saturday night at her home in Ormond Beach, Fla. She was 80. She had suffered several strokes recently, according to a former staff member, William Howard. 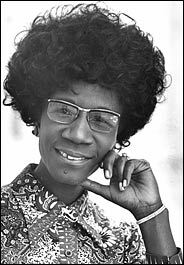 Mrs. Chisholm was an outspoken, steely educator-turned-politician who shattered racial and gender barriers as she became a national symbol of liberal politics in the 1960's and 1970's. Over the years, she also had a way of making statements that angered the establishment, as in 1974, when she asserted that "there is an undercurrent of resistance" to integration "among many blacks in areas of concentrated poverty and discrimination" - including in her own district in Brooklyn. "Just wait, there may be some fireworks," she declared after winning her seat in Congress in 1968 with an upset victory in Brooklyn's 12th Congressional District, which had been created by court-ordered reapportionment. Her slogan was "unbought and unbossed" - in the primary, she had defeated two other candidates, William C. Thompson, whom she maintained was the candidate of the Brooklyn Democratic organization, and Dolly Robinson. "The party leaders do not like me," Mrs. Chisholm said at the time. But about 80 percent of the registered voters in the district - which included her own neighborhood, Bedford-Stuyvesant - were Democrats. That edge helped her in her race against James Farmer, a leader of the Freedom Rides in the south in the early 1960's, who ran as an independent on the Republican and Liberal lines, and Ralph Carrano, who ran as the Conservative candidate. "I am an historical person at this point, and I'm very much aware of it," she told The Washington Post a few months after she was sworn in. Soon she was challenging the seniority system in the House, which had relegated her to its Agriculture Committee, an assignment she criticized as irrelevant to an urban district like hers. "Apparently all they know here in Washington about Brooklyn is that a tree grew there," she said in a statement at the time. "Only nine black people have been elected to Congress, and those nine should be used as effectively as possible." She said that the House speaker, John W. McCormack, had told her to "be a good soldier" and accept the agriculture assignment. Instead, she fired a parliamentary salvo at the chairman of the House Ways and Means Committee, Wilbur D. Mills, who handed out the committee assignments. Before long, she was reassigned, first to the Veterans Affairs Committee, and eventually to the Education and Labor Committees. Winning a better committee assignment did not make her any less acerbic on the workings of Washington. "Our representative democracy is not working," she wrote in a 1970 book that borrowed her campaign slogan as its title, "because the Congress that is supposed to represent the voters does not respond to their needs. I believe the chief reason for this is that it is ruled by a small group of old men." In 1972, when she entered the presidential primaries, she did not expect to capture the Democratic nomination, which ultimately went to George S. McGovern. "Some see my candidacy as an alternate and others as symbolic or a move to make other candidates start addressing themselves to real issues," she said at the time. She did not win a single primary, but in 2002, she said her campaign had been a necessary "catalyst for change." She was also aware of her status as a woman in politics. "I've always met more discrimination being a woman than being black," she told The Associated Press in December 1982, shortly before she left Washington to teach at Mount Holyoke College in Massachusetts. "When I ran for the Congress, when I ran for president, I met more discrimination as a woman than for being black. Men are men." Shirley Anita St. Hill Chisholm was born in Bedford-Stuyvesant on Nov. 30, 1924. Her father worked in a factory that made burlap bags, and her mother was a seamstress and domestic worker. They sent their daughter and her three sisters to Barbados, where the children lived with a grandmother until 1934. Mrs. Chisholm later described the relatives she encountered there as "a strongly disciplined family unit." But she had her own strength, too: "Mother always said that even when I was 3, I used to get the 6- and 7-year-old kids on the block and punch them and say, 'Listen to me.' "
Her professors listened to her at Brooklyn College, where she won prizes in debating. Some of them told her she should think about politics as a career. First, though, she taught in a nursery school and earned a master's degree in elementary education at Columbia University. Working as the director of the Friends Day Nursery in the Brownsville section of Brooklyn and the Hamilton-Madison Child Care Center in Lower Manhattan, she became widely known as an authority on early education and child welfare. She argued that early schooling was essential, saying she knew there were experts who maintained that children's eyes were not developed enough for reading. "I say baloney, because I learned to read when I was 3½," she countered, "and I learned to write when I was 4." From 1959 to 1964, she was an educational consultant in the day care division of the city's bureau of child welfare. But she laid a foundation for her eventual political career, working as a clubhouse volunteer and with organizations like the Bedford-Stuyvesant Political League and the League of Women Voters. So, when she decided to run for the New York State Assembly in 1964, she said the decision was straightforward: "The people wanted me." "I had been so consumed by my life in politics," she said in 1982. "I had no time for privacy, no time for my husband, no time to play my beautiful grand piano. After he recovered, I decided to make some changes in my life. I truly believe God had a message for me." She also sounded frustrated, saying she had been misunderstood for much of her career. She mentioned her hospital visit to George C. Wallace, the Alabama governor who built his political career on segregation, after he had been wounded in an assassination attempt in 1972. "Black people in my community crucified me," she recalled. "But why shouldn't I go to visit him? Every other presidential candidate was going to see him. He said to me, 'What are your people going to say?' I said: 'I know what they're going to say. But I wouldn't want what happened to you to happen to anyone.' He cried and cried and cried." She maintained that her visit had paid off. "He always spoke well of Shirley Chisholm in the South," she said, adding that she had contacted him in 1974, when she was looking for votes for a bill to extend federal minimum-wage provisions to domestic workers. "Many of the Southerners did not want to make the vote. They came around." Mrs. Chisholm moved to Florida in 1991 and said in 2002, "I live a very quiet life." She said she spent her time reading biographies - political biographies. "I have faded out of the scene," she said. When she left Washington, she said she did not want to go down in history as "the nation's first black congresswoman" or, as she put it, "the first black woman congressman." "I'd like them to say that Shirley Chisholm had guts," she said. "That's how I'd like to be remembered."